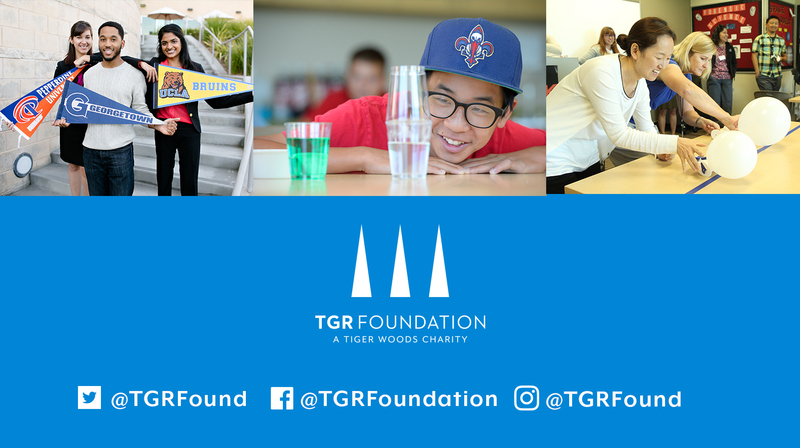 Supporting high-potential students with demonstrated need and a commitment to community service, the Earl Woods Scholar Program goes far beyond financial assistance. Each Earl Woods Scholar also receives mentoring support, specialized internship opportunities, career development and enrichment workshops. To encourage personal growth and enhance professional development, the Earl Woods Scholar Program provides an array of interactive learning and engagement opportunities for scholars on an annual basis. Before beginning their first year of college, all incoming scholars are welcomed into the program through the Pre-College Retreat, which covers a series of topics that help prepare students for college life. One of the program’s staples is the Winter Workshop, held annually at the flagship TGR Learning Lab in Anaheim, California. Over the course of the three-day event, scholars from around the country participate in informative workshops that include resume writing, interview training, graduate school and human resources preparation, industry panels and networking events. Along with workshops, this particular event honors our graduating scholars with a special luncheon to celebrate their accomplishments with family, mentors and fellow scholars. The cornerstone of the Earl Woods Scholar Program is its mentor network. These valuable relationships are life-changing for the scholars, many of whom are first-generation students with little or no practical guidance on college life and career planning. Each Earl Woods Scholar is partnered with a dedicated mentor who serves as an advocate, career coach, personal advisor and role model throughout their college experience. The mentors provide their scholar with advice and resources needed to help them succeed within their chosen degree and develop skills necessary for their professional career. An emphasis on real-life work and cultural experiences are highly encouraged among the Earl Woods Scholars as an avenue to build power skills, prepare for the workplace and foster knowledge of a specialized career. Through professional enrichment opportunities, such as job shadowing, internships, fellowships and study abroad, the program provides valuable resources and information that assists scholars in building their resume as they pursue their career aspirations. The Earl Woods Scholar Program supports its scholars beyond obtaining a college degree. To ensure each scholar has a clear and focused exit strategy upon graduation, we help create a personalized career plan that supports their definition of success. Early in their college career, we integrate key elements, such as: self-assessments, career exploration, decision making and action steps that contribute to the next stages of their career paths. Starting in their third year of college, scholars engage in monthly coaching calls to develop practical skills and create strategies tailored to their individual needs. This is a crucial component of the program that helps each scholar navigate entry into the workforce or graduate school. Raised in poverty by his grandmother, Darryl Robinson became the first person from his neighborhood to go to college in two generations. An alum of the Earl Woods Scholar Program, Darryl is now enjoying his career as a business analyst at Deloitte. Born and raised in Washington, D.C., Darryl knew during his first week of grade school that he would be the first person in his family to go to college. And not just any college: Darryl attended Georgetown University. As a first-year student, he published an article in the Washington Post about education disparity and his experience as a poor African-American male studying at an elite institution. Throughout his first two years at Georgetown, he was plagued by the demoralizing thought that he didn’t belong there and was riddled with guilt for receiving the opportunity to study at one of the nation’s finest schools. It took two years of pushing through self-doubt and guilt before he realized that he deserved everything he had worked so hard for. Although there were hardships during those years, he successfully learned how to overcome failure, and he learned the power of mentorship by becoming both a mentee and a mentor. A constant theme in his personal story is others taking the time to invest in him, even when he doubted himself. His experience at Georgetown and the challenges of being a first-generation, low-income student left him with an urge to see others from similar circumstances succeed. Darryl firmly believes in the words of Takeshi Shudo: "The circumstances of one's birth are irrelevant. It is what you do with the gift of life that determines who you are." The premise of the mentorship program is simple: no one succeeds alone. Educational research demonstrates the value of one-on-one relationships as a means of helping individuals set goals and achieve them. An important pipeline is created when students who have been mentored graduate from college and become mentors themselves. By joining our mentoring program, you demonstrate your commitment to building a community of students and professionals in support of higher education and professional success. For more information on mentorship, please contact Lea Segura. Through the progression of their college career, we work collaboratively with key stakeholders, board members, corporate partners and sponsors to align internships and job shadowing opportunities with each scholar’s career interests. We encourage every scholar to seek internships for the year and/or summer. This is a great opportunity for them to gain hands-on experience and make their mark in the professional world. Are you, or anyone you know, in need of exceptional interns? If so, please email Lea Segura.